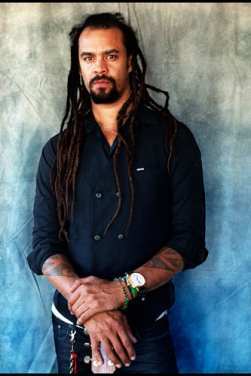 Known for his social activism as much as his fusion of musical styles, Michael Franti doesn't have a history of endorsing political candidates, but he respects many of the ideas that Barack Obama represents, not the least of which is energy renewal and efficiency. Franti even foreshadowed Obama's pledged closing of Guantanamo Bay when he sang "Someday Guantanamo Will Fall" on "Life in the City," a track from his most recent album with his band Spearhead, All Rebel Rockers (2008). Inspired by the November 2008 election-night festivities, Franti wrote "Obama Song" in tribute to the 44th president. Now, he talks about Obama and other inspirations. The latest book or movie that made you cry? "Slumdog Millionaire," which is a fantastic movie, an incredible movie. In addition to being a bit of a tearjerker, it's also incredibly uplifting and life affirming. The last book that made me cry was "Three Cups of Tea: One Man's Mission to Promote Peace ... One School at a Time." The greatest album ever is my iPod! Probably my favorite record that I've listened to more than any ... there's a few. There's Marvin Gaye's What's Going On (1971), there's Bob Marley's Kaya(1978) and probably third would be Radiohead's OK Computer (1997). Still I'd have to vote for my iPod. You're proud of this accomplishment, but why? My greatest sense of accomplishment has come from having two amazing sons, but it's also a paradox in that the times when I felt like the biggest failure have been times when I felt like, as a parent, I wasn't making the right decisions or succeeding in the way that I should. Being a parent is both the biggest joy and, at times, when I have judged myself the hardest. You want to be remembered for ...? I'd like to be remembered as somebody whose music made a difference in people's lives. It could just be that there was somebody who was having a difficult time in their life and trying to turn themselves around and my song meant something to them in that moment. The creative masterpiece you wish bore your signature? I get insanely jealous anytime I hear a cool song (laughs). It could be any song. For awhile, my son was really into this "Peanut Butter and Jelly" hip-hop song. It has about 25 million hits on YouTube. I was like, Damn, I wish I would have written the "Peanut Butter and Jelly" song. I can ride a bicycle backwards. I can juggle pretty well. I'm a really, really great roller skater, not in-line skating, but disco skating on roller skates. The best piece of advice you actually followed? Give selflessly without any expectation of return. The best thing you ever bought, stole, or borrowed? I could tell you the worse thing I stole was a piece of peppermint candy when I was like, 7 years old. The reason it was so bad is because when my dad found out, he whupped my tail so hard, I never stole again in my entire life. Maybe that was the best thing. Time travel: where, when and why? Absolutely the future and absolutely not the past. Have we accomplished the goals of sustainability that we're so hopeful for today, and have we solved some of the issues in the world like war and hunger and AIDS? Where would we be with these issues that are the questions of today? What do you want to say to the leader of your country? I think that my one bit of advice would be: Be the best listener you possibly can. My gift would be to say I'm here to do whatever I'm capable of doing that you request. Last but certainly not least, what one of the recent things you've worked on? On the night of the election I was on a plane to Montreal. I could've been in Chicago in Grant Park – instead I was not even in America. Of all the nights to not be in America! I wanted to capture the feeling that I had when I heard the election results. Tons of Canadians were just out in the street singing and dancing, just reveling in the motion of the moment, and so I wanted to put that into a song and "Obama Song" is what came out.